Tele Vue's updated Tele-Pod v2 Alt-Az Telescope Mount gets an updated tripod while remaining the convenient, easy-to-use travel mount that is ideal for telescope optical tube assemblies (OTAs) up to about 76mm for astronomical use and 85mm for terrestrial. With this kit you get the Tele Pod manual alt-az yoke mount and its Advanced Aluminum Tripod. Tele Vue designed their Tele-Pod Alt-Az Yoke Mount for smooth and balanced tracking for OTAs up to 3" in aperture. It is configured as a dual-fork yoke mount that cradles your OTA at its center of balance for smooth pan/tilt motion with reduced vibrations, and smooth-motion altitude and azimuth bearings with tension adjustments. A single control handle enables precise control without the associated vibrations that normally come with moving a mount by hand. The unique design allows for the OTA to move through an 85 to -10° altitude range from below the horizon (such as viewing from a hilltop) all the way close to the zenith. A scope-stop helps to prevent damage if the objective end 'nose dives' down. The Tele-Pod is offered here as a mount head only, and comes equipped with 1/4"-20 and 3/8"-16 mounting treads for easy attachment to most photo, video, field, or astronomical tripods. Mounting holes on the azimuth plate are pre-drilled for 1/4"-20 and 3/8"-16 bolts for attaching OTAs. 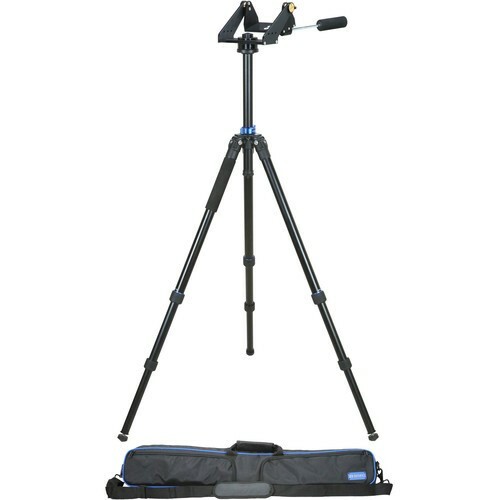 Designed for their smaller alt-az mount head, but ideal for spotters, binoculars, and cameras of all sizes, the Tele Vue Tele-Pod Advanced Aluminum Tripod features an adjustable height from 29 to 60 inches, with an extendable center column to accommodate a variety of users, viewing positions, and optical designs. The base of the column features a weight hook for added stability, as needed. The three leg sections have a standard set angle for maximum stability, but can move out further with the leg angle lock disengaged for use in difficult terrain or unique situations. When used on smooth and flat surfaces, the rubber tipped feet ensure stability without slipping or sliding, and if it needs to be used on soft or uneven ground, the included spiked feet can be quickly installed for secure footing. An integrated bubble level allows you to precisely level the tripod for accurate alignment, and a reversible 3/8"-16 to 1/4"-20 mount makes it compatible with most heads, or other gear. For convenience, Tele Vue includes a soft nylon carrying bag with a zippered closure and shoulder strap.